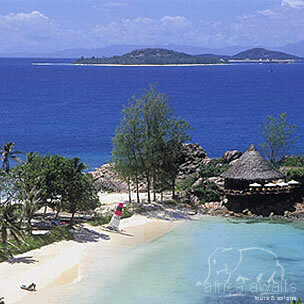 Lémuria Resort is a 5-star deluxe resort with an 18-hole championship golf course in the Seychelles. Just five minutes away from Praslin Airport, Lémuria is ideally situated on the northwest coast of the island. It is surrounded by secluded white-sand beaches and rare vegetation, washed by the warm waters of a lagoon on one side and open seas on the other. Lémuria Resort is a 5-star deluxe resort with an 18-hole championship golf course. Just five minutes away from Praslin Airport, Lémuria is ideally situated on the northwest coast of the island. It is surrounded by secluded white-sand beaches and rare vegetation, washed by the warm waters of a lagoon on one side and open seas on the other. The resort’s architecture and interiors were created with natural materials such as wood, stone, pink granite and thatch. Everything is inl harmony with the environment, in accordance with the strict conservation regulations that govern and protect the Seychelles. To respect nature, even the lighting has been ingeniously designed so that turtles are not disturbed when they come ashore at night to lay their eggs. Suites: 96 Suites, eight Villas and one Presidential Villa. All are oriented towards the Indian Ocean, spreading over 11 hectares of land. 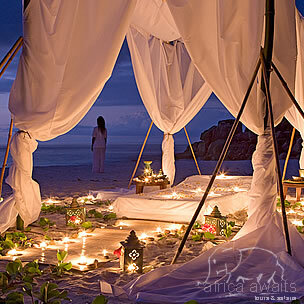 The suites lie scattered along two pristine beaches, one southwest and one northwest. Each suite is positioned just 15 metres from the shore, discreetly nestled in nature. 88 Junior Suites (52m²) are situated in lodges by the golf course. All single-storey, they are intimate spaces in harmony with their natural surroundings. Each suite is designed along minimalist yet luxurious lines. Amenities include ceiling fans, large bathrooms, a veranda, hammocks and sun loungers in the shade of overhanging palm trees. All suites have a shower, water closet, hairdryer, mini-bar, safe, TV, DVD, stereo compact disc and cassette player, telephone and answering machine. Two adults and one child sharing (under 12 years). Special rates apply for children/adolescents in their own junior suite. Ten interconnecting rooms are available. The eight Senior Suites (115m²) are all exceptionally spacious. They too are designed to blend in with their natural surroundings. Each lavishly appointed room has the same facilities as the junior suites, as well as a separate lounge and double-size terrace. All suites have a shower, WC, hairdryer, mini-bar, safe, TV, DVD, stereo compact disc and cassette player, telephone and answering machine. In addition, each room has a Jacuzzi. Senior suite: two adults and one extra bed for an adult or two extra beds for two children (under 12 years). The eight Private Pool Villas (725m²) have two bedrooms, a lounge, dining kiosk, massage kiosk, pool deck, open-air bath, terrace and swimming pool. Amenities comprise a bathroom with separate bath, outside shower, air-conditioning, TV, safe, DVD, CD and Sony PlayStation, mini bar, hairdryer. Villa Masters (private butlers) take care of every personalised service requirement throughout the guest’s stay. Guests booked in villas have access to all the hotel’s facilities. iPod docking stations on request and guests get their own golf cart (buggy). Pool Villa: four adults and only one extra bed for a child less than 12 years. This Villa (1 250m²) has three bedrooms, a lounge, dining room, executive office, pool deck, open-air bath, terrace and swimming pool on three levels. Amenities include a bathroom with separate bath, outside shower, air-conditioning, TV, safe, DVD, CD and Sony PlayStation, mini bar, hairdryer. Presidential Villa: Six adults and one extra bed for a child under 12 years. The Turtle Club comprises a games room and dining area for children between four and 12 years old. It’s open from 9am to 9pm. Indoor and outdoor activities take place daily under supervision and children’s menus are available on request. Baby-sitting can be arranged – rates on request. The hotel provides a wide range of water and inland sports as well as recreational activities. At the boat house, non-motorised sports are offered in order to preserve nature. Two floodlit tennis courts, windsurfing, Hobie catamarans, snorkelling, pedalos, kayak, laser dinghies, golf green fees. Other activities: scuba diving and PADI diving school, deep-sea fishing, watersport lessons and mountain biking. This restaurant provides great food and a wonderful setting for a candlelit dinner overlooking spectacular gardens. Enjoy Mediterranean cuisine in a relaxed ambiance overlooking the golf course. You’ll have a superb view of the 11th green. With a breathtaking view of two beaches – the small and grand Kerlan Coves, this restaurant is ideal for grills, seafood and cold buffets. Picnic baskets are also provided on request. Praslin; Par 70; 5 341m. Professionals and amateurs alike will find this course a challenge. It borders the enchanting beaches of both the small and grand Kerlan Coves. Palm trees, allowing the light to intermittently filter through, fringe the first 12 holes. From the 13th hole, the course extends over the steep slopes of a thickly forested hill, giving breathtaking vistas. Green fee is waived for residents of Lémuria Resort. - All major credit cards are accepted at no surcharge. - Extra dinner supplements are applicable for lobster and caviar. - Extra dinner supplements are applicable for Christmas and New Year’s Eve dinners and are compulsory. Supplements are included in our rates. - Minimum stay is eight nights during peak season: 23 December – 2 January. - Strict cancellation fees apply during peak season. Cancellations made between 1 December and 7 January are liable for 100 percent fees of total stay. 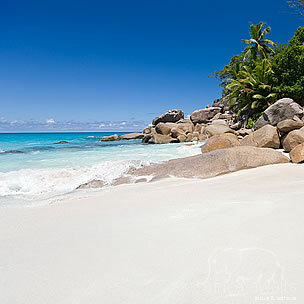 With your holiday, safari or business trip from in to Lemuria Resort in Seychelles.